Winter finally bid us good bye! We can wear something on our feet that’s not winter boots! I have to admit, during the winter, I often times snuggle up in my UGGS or I would be in ankle or knee high boots. With the weather getting warmer, I’m excited to have more options for my feet. And most of all, I’m excited to once again whip out my Charlotte Olympia Kitty Flats! Ah yes, today, we’ll be talking about the Charlotte Olympia Kitty Flats. They’re my absolute favorite pair of flats. I’ve been dreaming about owning a pair since they first came out in 2010 or 2011? I forget… It was quite some time ago. I’ve been to a Charlotte Olympia sale before in New York, but no couldn’t get a classic pair that I liked. It was last summer, during my visit to Hong Kong that I finally got my hands on a pair. I’ve been wearing them nonstop ever since. They’re my absolute go to shoes because they’re oh so comfortable. The Kitty flats are priced at $495 USD + tax. The classic material is velvet with leather lining and made in Italy. It also has a beautiful gold heel that measures 0.5 inches. I have the classic black pair, because after everything, I decided to stay with a pair of classics. They have many seasonal limited edition ones that are super cute, and often times embellished with jewels or sequins. But, for a pair of flats that cost around $500, I felt going classic would last me longer. But I certainly would love to own another pair with a snazzy design one day! The price for these pair of flats are quite hefty. That’s why it took me forever to take the plunge although I had eyes on it since forever. But, now I consider them revolutionary to my wardrobe. The quality of these flats are exceptional and it feels luxurious on my feet. The interior leather is extremely soft and smooth! However, they’re still “flats” so if I walk in them for a long time, the balls of my feet do experience capsulitis pain. However, I don’t believe it’s a flaw of the design. They’re still just flats and not sneakers. But, they’re the most ideal pair of flats you would own. And boy, do I love the way the mini heels clack away! It’s like I’m wearing high heels! I strut in these with high confidence! And the kitty is just ohhhh so cute! I have a soft spot for black kitties, because I have a black cat myself. So these flats are a constant reminder of her. Now everything aside, these flats are at least half a decade old in design. The question is, are they still worth the purchase? Some may argue that it’s way past their time. Some may argue that the kitten design will not be “timeless” if you’re going to be in your 30’s plus. But I see popularity in the Kitty flats still. There’s still many dupes of it and that proves its still popular. I’ve seen bloggers and fashionistas rock them out in all ages! The kitty fever will NOT die! And the comfort they give you is something that is “timeless” and worth the investment. So why second guess yourself? If you’ve loved them for ages and still want them. Jump the bandwagon and get them. I promise you’ll experience a fairy tale like no other. Ok… maybe not. But you’ll feel like Cinderella when you slip them on! Let me know if you plan on getting them or have them on your wish list! There’s so many colors! What color would you like? Also, let me know if you think they’re timeless like I do! These are definitely on my wish list! So fun yet classic. These are really cute. They have been big in the UK for a couple of years now. A really cute take on the classic pump. Those flats are super cute. I am always in flats, so I am diggin’ these. Flats are the way to go! These ones are super cute and I love how well you showed them off! Hey. They make the same design in pumps! Just I feel the flats version is more comfortable and versatile. These are so cute! I adore flats because you can dress them both up and down! These look so comfortable! Those flats are so chic! I think they look so fabulous on you and I love that they are so comfortable! I think Charlotte Olympia makes some of the comfiest shoes! These shoes are so adorable! I know a lot of people that would love to have these! I personally can’t wear this style (I’m way too old) but it would look amazing on younger ladies! The shoes are too cute! Great pictures! I love those cat flats, they are too cute! I need a pair! I absolutely love these! I am a total cat person, so these are the shoes for me. Plus they’re flats–I don’t do heels, only flats. Flats are the best!!! Super comfortable, not having to struggle with heels, while also looking good! These flats are gorgeous! Love the little ears from the shoes, so cute! I really like your shoes, they are so fun and pretty. These are such adorable shoes! I really ought to expand my own shoe collection as I have very few pairs. Ohh I love this! Looks very comfortable to wear and it simple with unique design. I’d love to have one! The shoes are cute. But you look absolutely amazing in the dress. Very stunning. Not exactly a kitty fan but you got me at very comfortable pair of flats. 😀 Only if I can afford a pair. I’ve seen a lot of people wearing these cat flats. I have never seen them in stores though!! My mother in law would love them. These are so cute and your outfit is on point. Thanks for sharing! I am in love with these shoes! I think it’s absolutely adorable and it’s definitely something you’d have fun wearing during the warmer days of the year. I love how you styled it! I think these kitty shoes are adorable. Great for teens and young adults. Those are adorable flats. 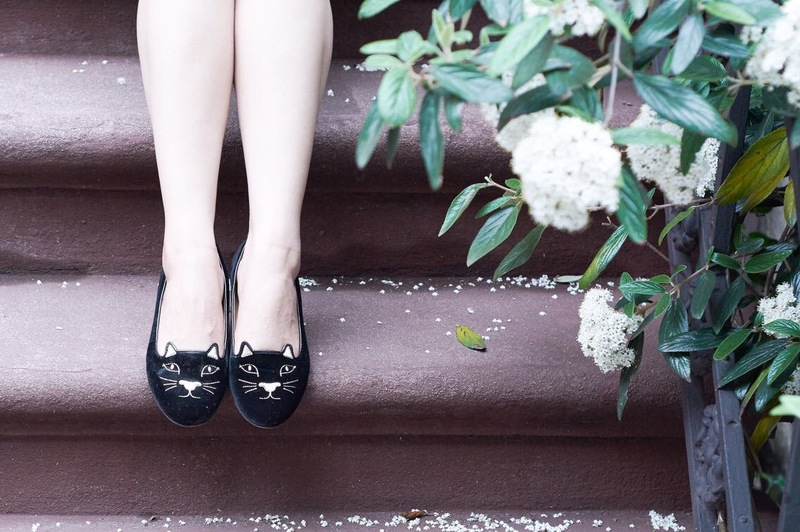 It’s no wonder why these Charlotte Olympia kitty flats are popular! Charlotte Olympia designs never fails to amused me. They always have awesome and fresh designs 🙂 Love your kitten flats! Love your flats! They are soooo cute! They are really cute. And I do have to say that they look really good on you. I just can’t imagine spending that much for food. I love flats and those are SO cute!! Super cute! I want those now!! Those flats are so cute! My daughter will love this! These are cute! I would wear these to work for sure. You look amazing in this one!